There will be a reception before the lecture at 6:30 pm in Duncan Hall (Martel). Space Frontiers lectures are free and open to the public; seating is limited and available on a first come basis. Paid parking is available by credit card at visitor lots on either side of the Founders Court lawn, near Duncan Hall. Plase enter the campus at Gate 1 or Gate 2 on Main Street, just south of Sunset Blvd. Click here for a campus map. America’s human spaceflight program is in many respects at a crossroads. The initial competitive force driving that program was the Soviet space effort. Today, in contrast, Russia provides the only means America will have to put astronauts in space for the next half-dozen years. The competition within the U.S. between robotic discovery and human exploration continues—as does the danger of setting goals substantially greater than the means available to achieve them. Several major independent studies have been conducted over the years seeking to point the way forward. It was the author’s privilege to participate in two of these reviews sponsored by the White House, including the most recent one. Some alternative futures for the U.S. space program will be postulated…and the greatest obstacle identified. Norman R. Augustine was raised in Colorado and attended Princeton University where he graduated with a BSE and MSE in Aeronautical Engineering. He was elected to Phi Beta Kappa, Tau Beta Pi and Sigma Xi. In 1958 he joined the Douglas Aircraft Company in California where he worked as a Research Engineer, Program Manager and Chief Engineer. Beginning in 1965, he served in the Office of the Secretary of Defense as Assistant Director of Defense Research and Engineering. He joined LTV Missiles and Space Company in 1970, serving as Vice President, Advanced Programs and Marketing. In 1973 he returned to the government as Assistant Secretary of the Army and in 1975 became Under Secretary of the Army, and later Acting Secretary of the Army. Joining Martin Marietta Corporation in 1977 as Vice President of Technical Operations, he was elected as CEO in 1987 and chairman in 1988, having previously been President and COO. He served as president of Lockheed Martin Corporation upon the formation of that company in 1995, and became CEO later that year. 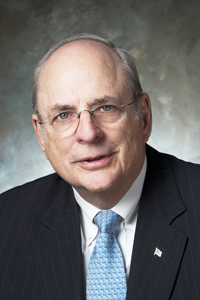 He retired as chairman and CEO of Lockheed Martin in August 1997, at which time he became a Lecturer with the Rank of Professor on the faculty of Princeton University where he served until July 1999. Professor Augustine has traveled in 109 countries and stood on both the North and South Poles of the Earth.